Experience a trip of pure unsurpassed beauty, luxuriant vegetation, and exploding whitewater on this full day tour for the adventuresome beginner and experienced rafter. Along the way you will be astounded by the awesome canyons, waterfalls, and primary rainforest. The Rio Savegre is a magnificent stretch of coastal whitewater that begins its course by winding out of a sparsely inhabited valley, covered with jungle vegetation. The whitewater rapids are exciting, but not so demanding that you won't have time to enjoy the Savegre's spectacular tropical scenery. The Savegre River is one of the most pristine rivers in the country and is surrounded by impressive views of the primary rainforest. Lurking just behind the shroud of lush foliage, you will find a number of truly magnificent waterfalls of the Savegre tributaries. We will stop for a break at some of the most beautiful waterfalls and swimming holes in the area surrounded by blooming heliconias in this shady Garden of Eden. Keep your eyes on the rainforest as well since wildlife is abundant as you float down the river in some of the calmer areas. Don’t miss this exhilarating ride through nature. optional and a change of clothes. Tour includes: Transportation, bilingual guide, fruits, snacks, lunch and beverages. 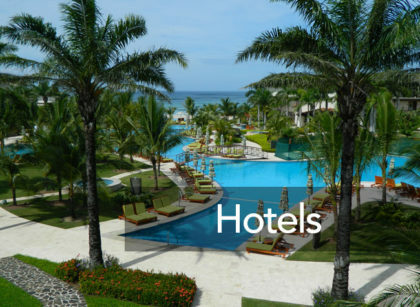 Only a short drive from your hotel (approx. 30 min.) the Naranjo River is a Class III / IV half day challenge for more experienced paddlers. The Naranjo River drops steeply from the coastal mountain range above Quepos through a beautiful jungle gorge, and takes you on a wild ride to sea level passing nearby farmlands and palm plantations. The river banks are overgrown with jungle and the canyon walls meet the water at 90° angles. The water, jungle, canyon, and sky make for an unforgettable day. 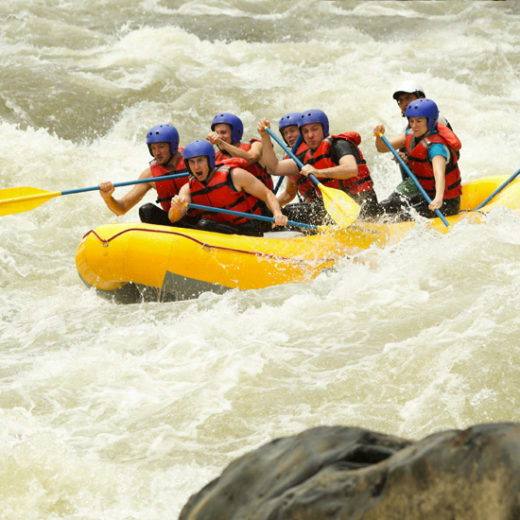 For the advanced rafter, this exciting and refreshing ride through the Naranjo Canyon, a jewel of Costa Rica, will provide the beauty and thrills you expect in whitewater rafting. If you are a first time paddler who welcomes a challenge and are looking for the excitement of big waves, and stunning scenery, then this trip is for you! Unlike its more even-tempered twin, the Naranjo blasts steeply out of the mountains crashing through deep unrelenting gorges and tight rock-walled canyons. Even after breaking into the open valley, it remains aggressive throughout its course to the town of Londres. Below Londres the lower sections of the Rio Naranjo gradually settle as they flow towards the Pacific. You have to see it to believe it. Primary and secondary forest, water, canyon and sky are unforgettable. 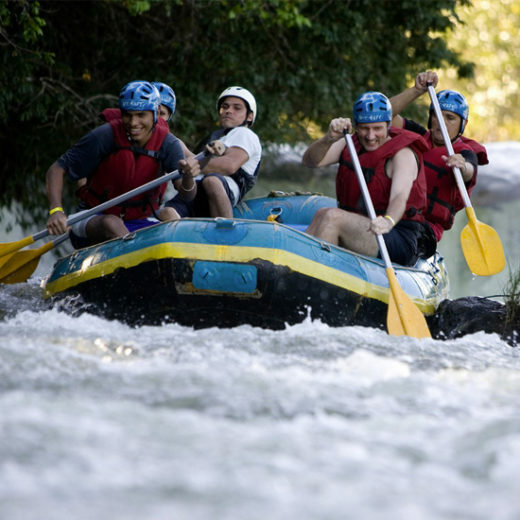 If you want to complete your river running experience, come to the Naranjo River. The Naranjo and the Savegre are twin rivers that run an almost perfect parallel course out of the Talamanca mountain range into to the Pacific Ocean where they form the north and south border of Playa El Rey. Recommended: Rubber soled shoes, swimsuit, shorts, hat, towel, waterproof sun protection, T-shirt is optional and a change of dry clothing. Tour includes: Transportation, bilingual guide, fruits, snacks and lunch. Quietly explore the protected estuaries of Damas Island. Easily paddle the lush mangroves to watch the abundant wildlife which includes hundreds of birds, coatis, and silky ant eaters. Immerse yourself in indescribable beauty, where nature reveals its flawlessness. In the mangrove, everything flows harmoniously; the blend of fresh and salt water, the diversity of the most extraordinary plants and the wildlife in all its splendor. This tour will show you nature's unparalleled wonders, just 10 minutes from Manuel Antonio. The canals lead you on a ride through nature and time, let the current carry your kayak through this miraculous experience! Paddle protected inland waterways, a perfect place to learn this magical way of exploring coastal mangrove areas and observing wildlife. None of this trip is in the open ocean and the pace of this trip is according to your abilities. Lunch is at a great seafood restaurant. Recommended: Light clothing, swimming suite, camera, hat, sunglasses and sunscreen. Tour includes: Transportation, guide, equipment, beverages and lunch. This tour is a challenging half day journey along the coastline of Manuel Antonio, closely passing islands and inlets that are the mating refuges of many species of marine birds. Visit islands to see the nesting grounds sea birds, stop and swim at a beautiful hidden bay and enjoy a delicious snack on the secluded beach. 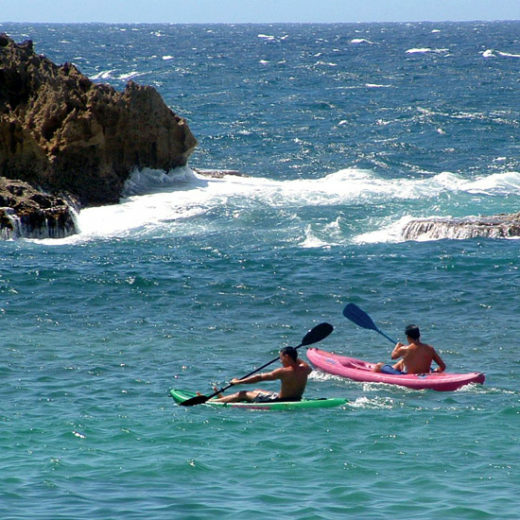 Paddling a kayak on the open ocean can be an exciting way to experience Costa Rica's marine and coastal wonders. 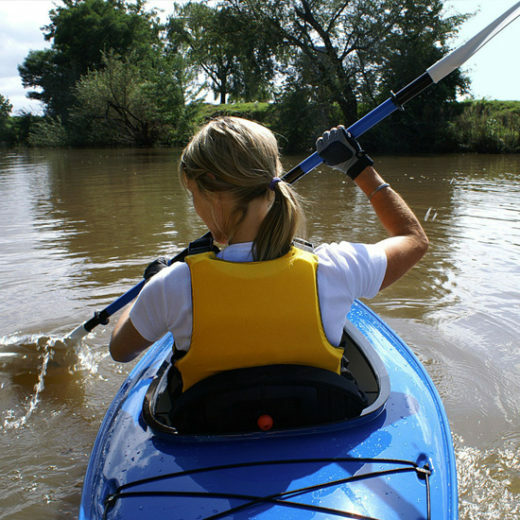 Sea kayaking is much easier than river kayaking and most trips can be done by people who have never tried the sport before. A sea kayaking tour is an opportunity to get a close look at the myriad of life below and above the ocean's surface from flying fish and sea turtles to frigate birds and pelicans. Explore some hard to reach offshore islands and coastal estuaries. Tour includes: Transportation, guide, equipment, snacks and fruits, beverages and lunch. Enjoy the magnificent Manuel Antonio National Park. Early in the morning the guide will be ready to transfer you to the beautiful park. Follow a professional guide through one of Costa Rica’s most famous National Parks. Spectacular natural beauty and peaceful atmosphere attract many visitors to the Manuel Antonio National Park annually. 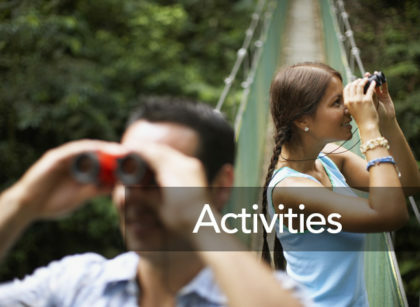 Explore a park that gathers numerous species of tropical butterflies, birds, monkeys, snakes, sloths, orchids, etc. Enjoy this guided walk inside one of the world’s finest national park. Come and enjoy all the wonders you may discover in this marvelous world that awaits you. 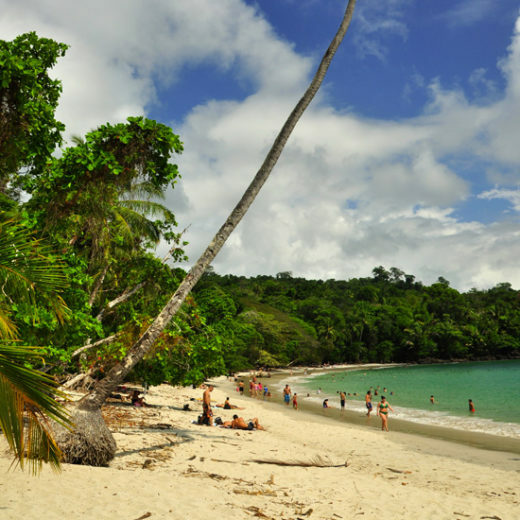 Also don't forget your swimming suit to enjoy the very beautiful natural beaches inside the Manuel Antonio National Park. Recommended: Walking shoes, comfortable clothes and sun protection. The Damas Island is about half an hour by boat from Manuel Antonio. On the trip to the island we will pass through the estuary, a magnificent opportunity to admire birds, as well as wildlife such as caimans, sloths, crocodiles, boas, white face monkeys, egrets and much more. Once on the island, a walking tour through the trails will take us to magic places. Enjoy the fascinating mangrove of Isla Damas on this relaxing covered boat tour through the complex estuary system. It is one of the most highly recommended tours of the area. This relaxing half-day tour begins just off shore of the Damas Island Estuary, about 5 kms south of Quepos. Your guide will pick you up at the hotel and drive you to the launch at Damas Island. Lunch will be served either before or after the tour depending on the time of departure. As you glide along the fascinating waterways in your covered motor boat, your guide will provide comprehensive information about the complex self-sustaining mangrove system. White, black, red, and pineapple mangroves are some of the varieties that you will learn to identify. Isla Damas features three types of mangrove forests connected by a myriad of choked and hidden waterways. Guests on this highly recommended tour are often rewarded with sightings of white-faced monkeys, silky anteaters, three-toed sloths, exotic bird species, crocodiles, boa constrictors, rare crab-eating raccoons, and the list goes on. On the way back to Manuel Antonio, a delicious lunch will be offered. Recommended: Light clothes, walking shoes, insect repellent, hat and binoculars. Tour includes: Transportation, guide, beverages and lunch. This incredible protected area measures about 4,700 Hectares and is home to approximately 48% of Costa Rica’s aviary species. The park's name, loaned from the Huetar natives, means crocodile. Anyone who visits will understand the significance of the name as the Tarcoles River (Rio Tarcoles), which forms the northern boundary to the park, is inhabited by crocodiles almost year round. 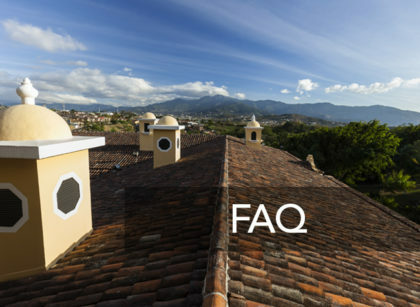 This tour will show you the importance of the region, as it is situated in a transitional region between the tropical dry forest and the humid pacific rainforest. You will appreciate colorful species of flora and fauna from a varied ecosystem. 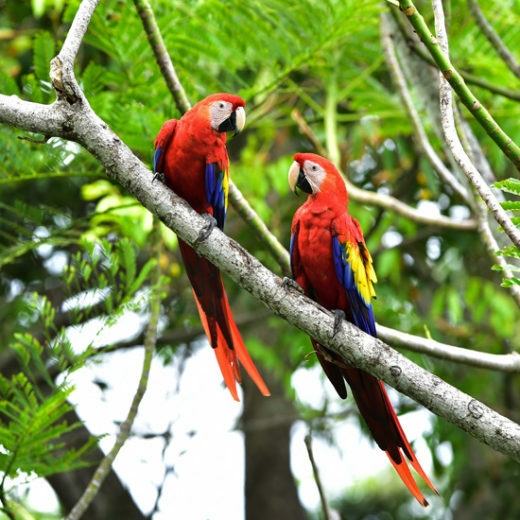 You will be able to spot the Scarlet Macaw, Collared Aracai and various monkey specimens. At the end of the tour your transportation will take you back to your hotel. Tour includes: Transportation, English speaking tour and entrance fee. Come with us and discover the coast of Manuel Antonio the way Christopher Columbus traveled. 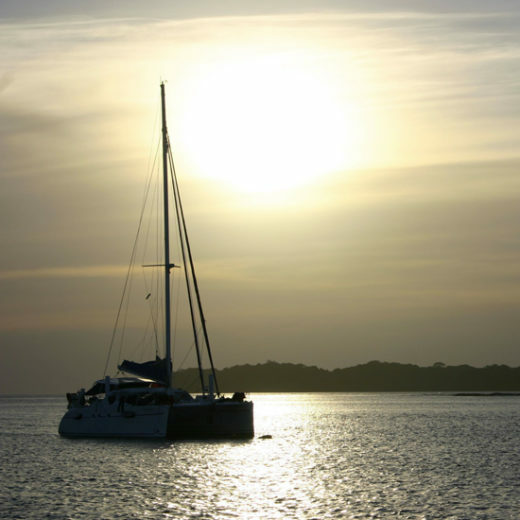 The peace and serenity of sailing these pristine waters is an unforgettable experience and viewing the sunset from the deck while anchored in a beautiful secluded bay is truly romantic. Your adventure aboard a catamaran begins as you sail down the scenic coast, past the beautiful beaches and islands of Manuel Antonio National Park. To take advantage of the weather, during the green season this is a mid-day cruise, and during the summer season it is a sunset cruise. As the boat glides quietly under sail, you are likely to see dolphins which frequently swim in the boat's wake. Occasional whales and sea turtles are a special thrill, and the abundance of ever present sea birds is enjoyed on this cruise. A relaxing journey through the calm waters of the Pacific Ocean with only the sounds of the sails is what you will encounter on the evening sail. Tour includes: Transportation, bilingual guide, snacks, lunch and beverages. Enjoy this amazing and unforgettable tour, where you can see big crocodiles reaching a length of about 5 meters. 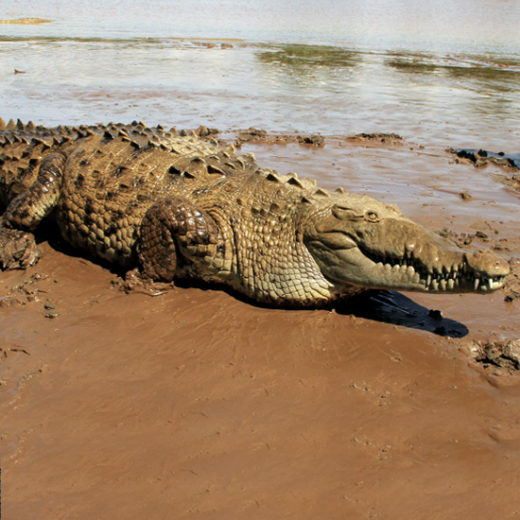 The Jungle Crocodile Safari Tour lasts about 2 hours in which we will explore the Tárcoles River. 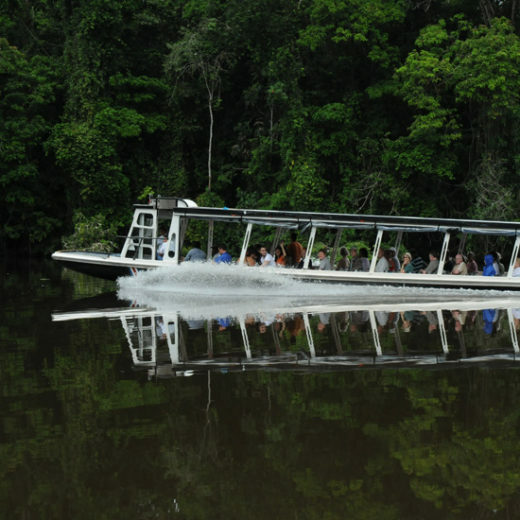 You will be accompanied by a captain and a tour guide, experts on fauna and flora of the river. During the tour, the boat will go through the Guacalillo Canal, an estuary where four species of mangrove (black, red, white and buttonwood) can be found. It's also an important refuge for scarlet macaws (Psittacidae Ara Macao), so its presence is very common. This tour offers to visitors free coffee and refreshing beverages before and after the tour. On the boat you will receive a full color brochure with information of more than 50 birds that can be seen during the tour. Tour includes: Transportation, bilingual guide, entrance fee and lunch. 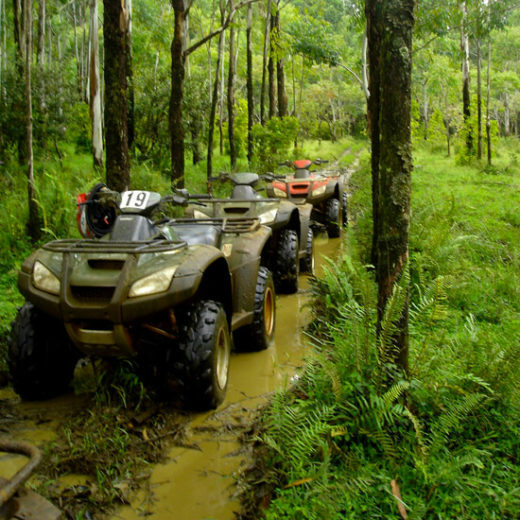 After hearing our safety & security instructions, drive your own fully equipped ATV into the rugged mountains, where your professional bilingual guides lead you through rustic tropical settings, we drive from San Antonio de Damas to see waterfalls and natural springs located in the unique rain forest ecosystem. During the tour we pass by four different types of plantations: teak, rice, papaya and African palm. Your guide will point out interesting facts concerning the environment. We also pass through several traditional Costa Rican towns; this gives you the chance to see a different more rustic side of Costa Rica. About half way through your journey, leave your ATVs on the trail for a short nature hike through the primary rain forest, with a little bit of luck on our adventure tour we will see: Titi Monkeys, Toucans, Sloths, various types of tropical birds. Then reward yourself by indulging in a breathtaking waterfall, where you can swim in refreshing, crystalline waters. End your exotic journey with a delicious Ticostyle meal at our private Ranch. Tour includes: All Terrain Four-Wheel Vehicles (ATV`s) fully equipped, safety helmets, experienced bilingual guides, terrific local snacks during the tour, meal and round-trip transportation. This Manuel Antonio tour is the perfect choice for those interested in getting wet and seeing nature! 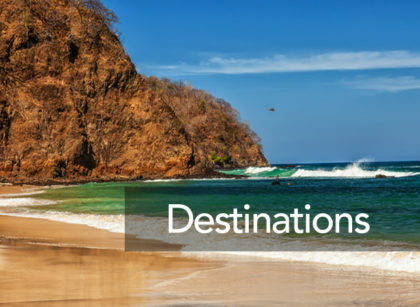 Transportation will be provided to pick you up from your hotel and drive you to the local Quepos dock. You will kayak for approximately 2 ½ hours (round-trip), during your journey you will paddle past islands and inlets where you can observe and admire numerous marine aviary species and their nesting grounds. Partway through your route you will stop at a beautiful hidden bay to rest and enjoy a refreshing snack. You can take advantage of the 30 minute pit stop to snorkel on this secluded coastline that goes by the name of Bisanz beach. Water visibility varies depending on the season. You are most likely to spot parrotfish, starfish, angelfish and if you are lucky a sea turtle or two! This challenging Manuel Antonio tours allows you to discover the stunning examples of nature both above and below the ocean’s surface; from pelicans to flying fish, you can see it all! Upon returning to the dock head back to base camp to enjoy a little conversation over a delicious homemade meal. Transportation will be provided to return you to your hotel. Kayaks are available in 1 passenger and 2 passenger format. Kids must be at least 8 years old to paddle alone. 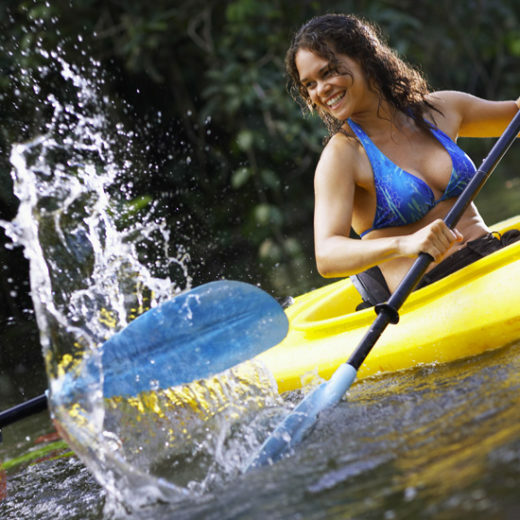 Sea kayaking is much easier than river kayaking, this Manuel Antonio tour does not require previous experience. Recommended: Suntan lotion, sunglasses, waterproof camera, hat, visor, mosquito repellent, bathing suit and beach towel. Tour includes: Transportation, bilingual guides, lunch and equipment.